More evidence has come to light of Syrian rebels receiving training from Western sources in neighbouring Jordan - but the Jordanian Islamists are also taking an interest in the conflict, as the BBC's Gabriel Gatehouse reports. Western governments and their allies in the Middle East are worried about the increasing dominance of radical Islamist groups in the Syrian conflict. The US on Sunday pledged to increase what it calls "non-lethal aid" to the more secular-minded Free Syrian Army. But there have also been reports - officially denied - that US military personnel have been training select groups of FSA fighters in neighbouring Jordan. In a nondescript block of flats in an anonymous Jordanian town, we met a senior commander from the FSA. He agreed to talk to the BBC only on condition of anonymity. "The lessons focused on small and medium arms, as well as mortars, RPGs [rocket propelled grenades,]" he said. The commander had not attended the training courses himself. But some of his fighters had and he had been asked to provide a list of names to be put forward for more training in the future. He said the training took place at a military facility outside the Jordanian capital. This information has been corroborated by other sources in the FSA, who told the BBC that fighters were trained in relatively small groups, on courses lasting two weeks. 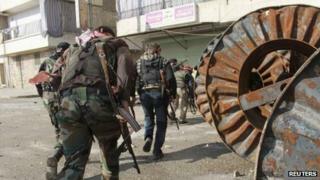 The government in Amman has denied that FSA fighters are receiving training on Jordanian soil. Washington has not officially commented on its alleged involvement, stressing only that its assistance to the FSA is strictly "non-lethal". But off the record, officials in both capitals have been quoted as confirming the existence of both the camps and of the presence of American trainers. Earlier this month, the Washington Post reported plans to accelerate the pace of the training, in the light of recent rebel gains in southern Syria. Western intelligence sources have suggested the training could be carried out by US-based private security contractors. "Most of the rebels have some education; it was not hard for them to detect the American accent of the trainer. He spoke through a translator. But the way he spoke indicated that he was American." But, he said, his men were dissatisfied with the level and quality of the training. "Most of the fighters were unhappy, because the training was on a very simple level. When they joined the revolution, they were already proficient in the use of small- and medium-sized weapons. They said the training did nothing to increase the FSA's abilities on the ground." But there are other groups too besides the FSA who are using Jordan as a base from which to further their aims inside Syria. And those aims do not necessarily coincide with those of the Americans. The town of Ma'an is a two-hour drive south of Amman through the featureless Jordanian desert. Image caption Abu Sayyaf says he believes that after the fall of Assad's regime there will be "other battles"
In a compound on the outskirts we met one of Jordan's leading Salafists, a man by the name of Abu Sayyaf. His full name is Mohammed al-Chalabi. In 2004 he was convicted of involvement in an al-Qaeda-linked plot to attack a Jordanian military base housing American soldiers. Mr Chalabi was later sentenced to death. But his sentence was commuted, and now he is out, helping to recruit young Jordanians to cross into Syria and fight with the Islamist rebel group the al-Nusra Front. "We have 500 of our men [Jordanian Salafists] fighting in Syria," he said, adding that more than 30 had been killed. "I tell young men it is the duty of Muslims from all over the world to help the vulnerable people of Syria." Earlier this month, leaders from al-Nusra announced their allegiance to al-Qaeda. Mr Chalabi said his Salafist movement shared the same goals. "Our aim is an Islamic government that establishes God's sharia law. Any regime that doesn't do this is blasphemous and must be removed." For now, the more secular-minded FSA and the Islamist al-Nusra Front also share a common objective: the removal of President Bashar al-Assad from power. But an ideological gulf separates the two groups. Some fear that could prolong the conflict. "We hope that the fall of the regime in Damascus will bring about the end of the conflict in Syria," Mr Chalabi said. "But my personal belief is that, after the fall of the regime, there will be other battles. The fight will last until God's laws are established on Earth." "In Syria," Abu Sayyaf corrected himself. Jordan's infrastructure is struggling to cope with nearly half a million refugees who have fled over Syria's southern border since the start of the conflict. But it is the prospect of Islamists gaining control of parts of its frontier with Syria, with the help of Jordanian Salafists, that is really worrying Amman. "This is the last thing we would like to see," said Mahmoud Irdaisat, the director of the Centre for Strategic Studies at the King Abdullah II Academy for Defense Studies in Amman. "Having extremist groups in Syria - that will invite so many problems to us in the near future." But current efforts to stem the rise of al-Nusra may be too little, too late. The FSA commander we met told us secular groups had been losing fighters to the better-financed, better-equipped Islamists. "Our lack of funds has driven many people to join al-Nusra. There used to be no more than 10 or 15 al-Nusra fighters in our area. I used to know all their names. Now there are thousands."